Have you ever desired making a difference in the lives of orphans and refugees, or combating human trafficking, providing winter coverings, giving clean water to those in danger of dehydration, sickness and even death, handing out Scripture into the hands of believers who don’t own a Bible, or discipleship resources to those without solid Biblical teaching, offering medical clinics to those who live remotely, or can’t afford seeing a doctor, or have never seen a doctor before? Simply put, do you have it on your heart to serve those in need in a way that you’ve never done before? Maybe you’ve felt frustrated by your lack of resources or the inability to travel or move to another country to serve on location. Perhaps you wish you could do more, have an impact in the world at large, but from your own, current location. Actually, now you can! This year, ServeNow has initiated a new volunteer program! 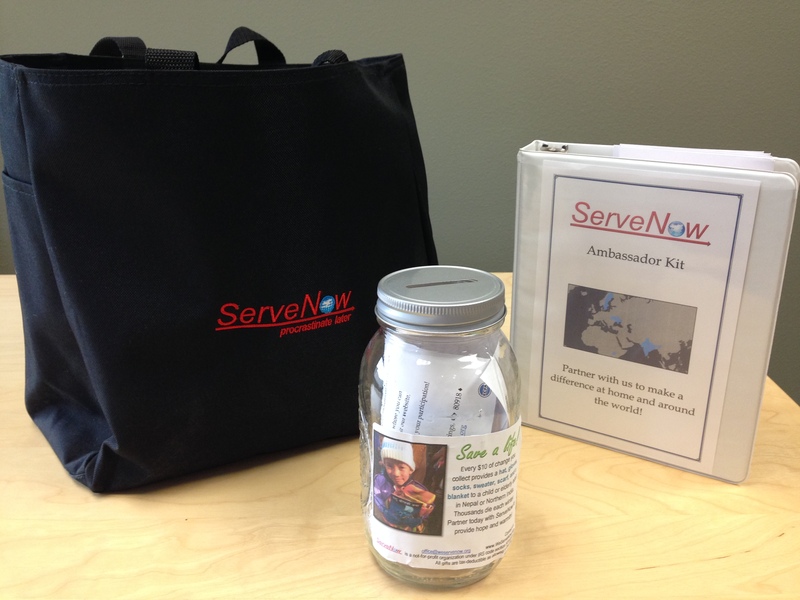 You can become a ServeNow Amabassador right here, at home, in your own community. We have put together a booklet filled with simple and practical ideas that you can implement “here”, while making a profound difference over “there” (see the book here: ServeNow Ambassador book). For example, you could help us by giving jars to friends and family; throughout the year, the jars can be filled with loose change which in the end will provide blankets, hats, gloves, jackets to those in Northern India and Nepal, where hundreds die every year (especially elderly and children) due to cold temperatures and lack of sufficient warm clothes. Or, during the summer months, you could host a car wash where donations would be given to provide clean water to families in need in certain states in India, where temperatures can reach 125 degrees and where hundreds die every year due to lack of water. You could get your home group, church, Sunday School class to provide a sewing machine or cosmetology kit for a girl who will graduate from one of our many tailoring or cosmetology classes, or you could sponsor a medical clinic or encourage your home group, bible study, youth group to equip a church with discipleship resources! There are so many simple and practical ways you can serve right here, right now, that will make a huge difference around the world! We would love to hear from you and help equip you in any way possible. You will receive a weekly report from around the world filled with story after story of lives being touched and transformed. You will receive an “Ambassador kit” to help you get going. Our staff will be available to answer questions, provide you with resources and materials to ensure your success. And, as a special incentive, the person who raises the most money through this program during the year, will receive an all-expense-paid mission trip with one of our teams. We invite you to come join a growing team of Volunteer Ambassadors and serve a world in need. Contact us if you are interested or want more information; or you can fill out the Ambassador application form here.We look forward to hearing from you!